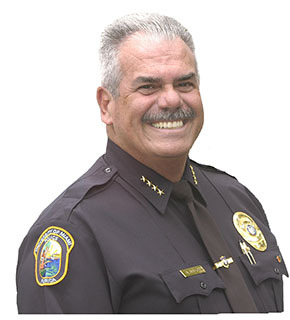 David A. Rivero joined the University in October of 2006, after retiring from an impressive 26-year career with the City of Miami Police Department as a Major. He arrived at the University with a modern, comprehensive vision for the UM Police Department, and set out to make UMPD a national model for professionalism and community-oriented policing. Since that time, Chief Rivero has successfully led UMPD to offer a substantial roster of crime prevention programs and services. As a result, the department has enhanced community reception to our policing initiatives and has built a force of exceptionally trained, motivated, and professional officers. We employ state-of-the-art equipment. The combined effect of all of these initiatives has resulted in significantly reducing crime on our campus. In February 2008, Chief Rivero was named “Director of the Year” by Campus Safety Magazine. The University of Miami Police Department (UMPD) is dedicated to providing a safe and secure environment for all members of the University community who study, research, work, and live on the Coral Gables Campus. To fulfill our mission statement as a collaborative, innovative and proactive law enforcement agency, the University of Miami Police Department takes a community policing approach. Frequent safety-related educational programming helps members of the community realize the power they have to prevent crime and keep themselves safe. Partnerships with the University community, the Coral Gables Police and Fire Department, the Florida Safety Council and several other government and private agencies allow us to offer a multitude of services. We believe that a stronger relationship between the UM Police Department and the University community makes for a collaborative, focused, and successful crime-fighting team. Operating 24 hours a day, 365 days a year, the University of Miami Police Department is composed of a highly-dedicated team of State of Florida certified, sworn Police Officers and Police Detectives. In addition, the department employs several support professionals, including a Crime Prevention Specialist, Supplemental Security Coordinator, Background Investigator and Data Custodian. University Police Officers conduct continuous patrol, respond to all emergencies calls on campus, address specific University problems that require immediate attention, take police reports, provide information, and actively participate in proactive crime prevention efforts. The Annual Security Report publication, accessible through the UMPD home page, provides detailed information on the UM Police Department, crime prevention programs, safety on campus, sexual assault resources, and also lists all crime statistics for campus, in accordance with state and federal law. This publication is updated and distributed to all students, faculty, and staff on an annual basis. On behalf of the dedicated men and women of the University of Miami Police Department, I welcome you to the UMPD web site and encourage you to explore the information that can be found here. It is my hope that this site will provide you with important insight into our department, its operations, and the many services and programs we offer to keep our community safe. If you do not find specific information you are looking for, please feel free to contact us. In addition, I invite your comments, questions, concerns, and suggestions regarding our department and public safety at the University of Miami. Please utilize our contact information, in order to best respond to your inquiries and correspondence. Finally, remember that crime prevention and personal safety begins with the individual. Please report criminal activity immediately, exercise crime prevention techniques, and remain vigilant of your personal safety.